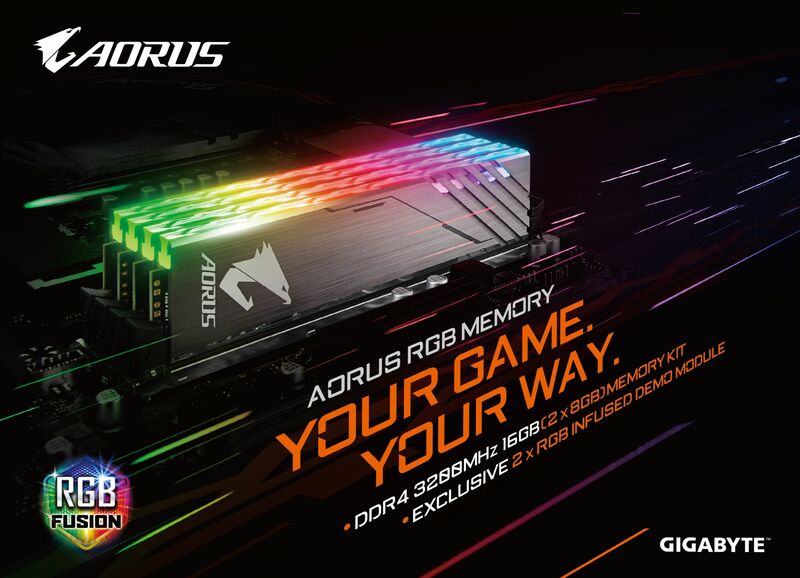 Taipei, Taiwan, July 4th, 2018 – GIGABYTE TECHNOLOGY Co. Ltd, a leading manufacturer of motherboards and graphics cards, announced its first XMP supported DRAM, the AORUS RGB Memory. With DDR4 XMP 3200 16GB（8GB*2）memory modules and exclusive 2* RGB Infused Demo Modules, AORUS RGB Memory delivers outstanding value to anyone seeking a combination of high-end performance and glowing aesthetics. GIGABYTE RGB Fusion and RGB Fusion Link software allow users to easily control over 5 new lighting effects available only for DDR so they can enjoy the most impressive RGB lighting effects memory kits have to offer. GIGABYTE introduced its AORUS RGB Memory at Computex 2018, garnering much praise among the media and receiving Best Product awards from the U.S. based Tom’s Hardware as well as the U.K. based TechRadar. AORUS RGB Memory Modules feature aluminum heatsinks with an anodized hairline surface for a sleek, metallic look. A standout feature of AORUS RGB Memory is the addition of 2 brand exclusive RGB Infused Demo Modules for pure RGB illumination and lighting effects. Without adding to the user’s budget, this feature makes it unnecessary for the user to purchase a completely different set of memory modules with RGB functionality to fill out the DIMM slots of the memory configuration. Users can now add RGB Infused Demo Modules to their boards to enjoy a full memory configuration packed with RGB brilliance. GIGABYTE AORUS RGB Memory supports a multitude of AORUS exclusive RGB lighting effects with a light diffuser on the heatsink to provide the perfect balance of light and style. All new light models and effects provide the user plenty of customizability and RGB lighting displays to configure. For software, RGB Fusion allows users to customize and synchronize lighting effects while RGB Fusion Link allows users with third-party boards to do so as well. In terms of hardware specifications, AORUS RGB Memory enters the market with 16GB (8GB*2) DDR4 3200MHz specifications. For current high-end PC systems, lower frequency memory setups don’t take full advantage of the performance these systems are capable of while higher frequency setups can be quite cost heavy for many users. GIGABYTE AORUS RGB Memory offers the perfect balance between performance and price to truly fulfill the potential of these high-end PC systems. To provide the best user experience, AORUS RGB Memory heatsinks are fused together via aluminum extrusion in a screwless design for solid structural integrity. The edges and main body of the heatsink are coated with anti-scratch material for added durability during installation. The AORUS eagle icon laser-engraved on the side of the module is both easily recognizable to AORUS fans as well as uniquely positioned for easier alignment when installing the module. The user can slide the module correctly into place by positioning the eagle icon so that it’s flying forward. AORUS RGB Memory heatsinks are an astounding 3x denser than that of standard memory modules for significantly more effective heat dissipation. Greater surface area from the multiple ridges on the heatsink also allows for better heat dissipation and prevents high temperatures from affecting memory performance. The X9 gives gamers exactly what they want - a brash and powerful gaming computer. If you are a high-end gamer with a suitably high-end budget, this may just be the laptop for you. The Aorus X7 DT v7 is a sleek, powerful laptop, presented almost perfectly. Buy the latest GIGABYTE AORUS Z370 motherboards get up to € 40 FREE STEAM Wallet codes ! X5 v7 provided everything that users need for high-resolution triple-A gaming.